Smart Dixie Jones “Smarty” and Tracy Campion (photo courtesy of Tracy Campion). Tracy Campion won’t ever forget the details of the riding incident that changed her life forever. Though everything happened in split second, she remembers exactly how it all transpired and, to this day, it sometimes replays in her mind when she least expects it, the details now burned into her memory and saved like a snapshot in her mental scrapbook. “I was in an arena and going from a trot to a canter,” the writer/magazine publisher recalled of that day in 2013 — ironically, in June, on Belmont Stakes Day — when she was catapulted off her beloved Quarter Horse, Beau. “He heard a noise outside the arena and spooked. He started bucking and I was trying to hold on, but I had forgotten to take off my spurs, so when I went to grip to hold on my spurs caught him and of course he kept on bucking. He threw me in the air and when I landed I remember lying on the ground and that I couldn’t feel my legs. Campion also recalls her recovery — in all its painful glory — just as vividly, but would much rather talk about the fact that about 4 ½ months after something that would have chased more people than not away from the saddle, she was back aboard her beloved Beau and doing what she loved most. And as much as she hoped for a complete recovery, both physically and mentally, post-traumatic stress disorder (PTSD) presented itself in Campion’s life like a bull in a china shop and it still hits her hard sometimes — often when she recognizes triggers, but even more so when she least expects it. Despite all the bad she’s endured and the unsettling memories, rock bottom was without a doubt the unexpected death of her best friend and “heart horse,” Beau, who she refused to ever blame for her accident. Anyone who has ever lost a loved one, but especially a pet in this instance, knows the heartache involved in the grieving process and the guilt in deciding when the right time to move on is. “Is it too soon? Will he know he’s been replaced?” we all ask ourselves, wondering if moving on somehow ruins the memory of them. Campion always knew that as much as she loved and missed Beau, there was a soul out there that needed her, and as a die-hard racing fan she also knew that her next family member would likely be from the off-track thoroughbred ranks. Campion considers herself a racing fan. All the big names are on her list of favorites — Ferdinand, Winning Colors, Mr. Frisky, Secretariat, Zenyatta, Winx — you name a star and she knows a fun fact about its career. She learned to read the Daily Racing Form by age 5 and would handicap, making enough money with the wagering her father did for her to pay for parking and admission to the track. One racehorse that always stood out to Campion, though, was 2004 Kentucky Derby winner Smarty Jones. Maybe it was his humble beginnings, his lower-profile connections, his diminutive size or just the unusual path to Louisville he took, but Campion was hooked from the minute she read about him. Never in her wildest dreams did she think she’d ever own one of his offspring. Anyone who knows anything about a retired thoroughbred knows how difficult they can sometimes be. The rumors of bad feet and tough-keepers and hot temperaments, even after they’ve been retired from their jobs on the racetrack, are common in the OTTB community and often true. What is also common in the tight-knit bunch of horse people, however, is the knowledge that OTTBs are also talented in almost any discipline requested of them, willing to learn, relatively easy to train and, of course, kind — all of which makes them ideal companion horses for riders of all skill levels. So, it was quite by chance, after an online search following the death of Beau in early 2017, that Campion stumbled across a flashy chestnut looking for a forever home. The best part, she remembers, is that she knew instantly who its father was because of his name — Smart Dixie Jones. “He” is Smart Dixie Jones, who is out of the unraced Dixieland Band mare Dixieland Rock, and was bred in Pennsylvania by Maple Leaf Farm and started 23 times in Maryland, Delaware and Pennsylvania, managing only to break his maiden and earn $26,403. He was, however, handsome and sound, making him an ideal candidate for rehoming and a productive second career. Soon after, Campion arranged to ship the gelding to her home outside Olympia, Washington, where she and Weideman would lay out a training plan for the new horse-and-rider team, which included, at some point, an attempt to return to jumping. But if the women were hoping for anything happening swiftly, “Smarty” (as he is now called) had other plans. In addition to losing a tremendous amount of weight during the shipping process, Smarty arrived with some of the worst feet the women had ever seen on any horse at any time in their entire life’s experience with horses. It wasn’t that he was, in any way, neglected by the rescue he was adopted from, he was just one whose feet issues could never be managed successfully up to that point. “He had some glue-on type shoes for abscesses and, when we went to remove one, it took off his hoof wall,” Campion said. “So, for a while, he had to wear special shoes. Smarty and Tracy (photo courtesy of Tracy Campion). Weideman, an Alaska native and longtime horsewoman who now operates a successful riding/boarding stable outside Olympia called Back to Basics Horsemanship, is first and foremost a mother to a child who has battled health issues so significant that they would bring most people to their knees. Her daughter, Allie, has battled a rare form of epilepsy her entire life, with the seizures so frequent and severe she underwent brain surgery a year ago. 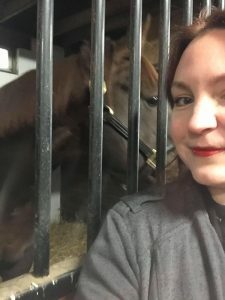 Yet, as much as her daughter’s health issues took her away from her normal existence and business as a horse trainer for extended periods of time, she still needed her horses and managed to lean on the animals and also the support of people at her barn for strength, especially one animal in particular. Smarty was happy and healthy at last, but Campion was in desperate need of guidance. Though she was able to ride, sometimes, when she least expected it, the PTSD creeped up on her and virtually paralyzed her. As it turned out, Campion’s need was an outlet for Weideman to release her own stress, as she had developed her own form of PTSD in the battle for her daughter’s life and happiness. “Sarah had her own stuff going on, so she was more than aware of how PTSD manifested itself in me,” Campion said. “She knows how to deal with the symptoms and how much to push when you’re ‘flooded’ and get a positive reaction. She could see it before I even knew it and always had the right thing to say to help. 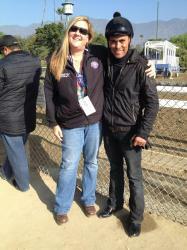 “Once I started riding Smarty, the biggest issue was realizing he wasn’t going to hurt me. When I’d get tense, he’d not go forward because he’d feel it. That took a while to get over. And he had his own issues with that. Aside from her own personal issues, Weideman acknowledges she has had plenty of practice helping people aside from just Campion and Smarty. Helping others helps her, Weideman knows, and she has always made these people and their situations a priority. Now, she can give them even more much-needed attention, as the most traumatic symptoms of her daughter’s epilepsy have diminished and reached a manageable level. Tracy has big plans for both her and Smarty in 2019 (photo courtesy of Tracy Campion). And Weideman is finally pursuing something she’d put on hold during the darkest days of her daughter’s illness. 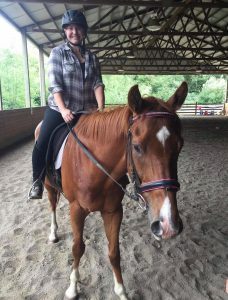 Boosted by the positive progress Smarty has shown, she plans on participating in the Retired Racehorse Project’s Thoroughbred Makeover held in October at the Kentucky Horse Park. Her teammate is a 4-year-old Kentucky-bred daughter of Haynesfield named Annual Reward, who ran her last race at Portland Meadows in early December. 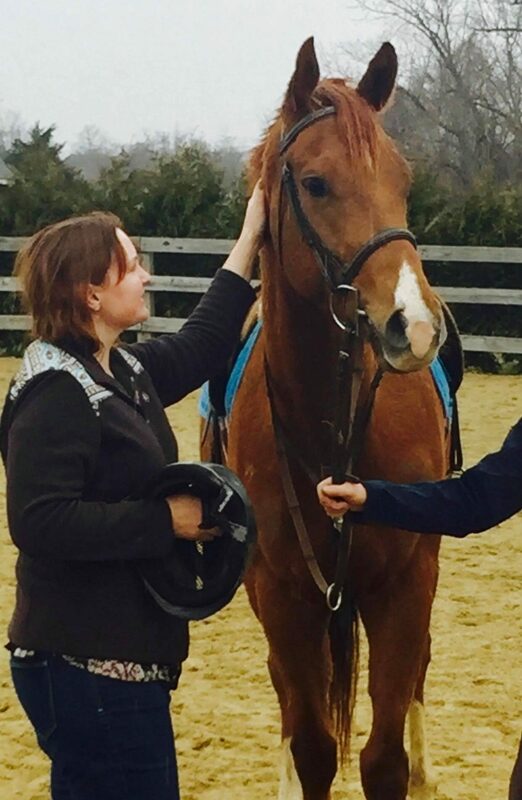 Now known as “Phoenix,” the chestnut filly is in the very early stages of training for the highly popular event. Currently, Smarty and his proud owner get a couple lessons from Weideman a week and go riding virtually every day. And Campion is setting some long- and short-term personal goals for both herself and the horse. They’re already doing some ground-pole work and basic flat exercises, with eyes focused on a future, maybe in the hunter or jumper ring. “I don’t really have a ton of expectations,” Campion said. “With all of his physical issues I never wanted to push him, but I now know we can do anything. I’m still deciding. [When the weather improves] I plan to go out and trail ride or even do some OTTB shows. Anything is possible. Arrogate: the $29 Million Horse?